**Disclosure: A sample toothbrush was provided to help facilitate this feature. To a kid, hygiene can seem like a hassle. Until they reach the teenage years and realize that people appreciate the use of soap, toothpaste, and deodorant, teaching children to practice good hygiene is essential to their health and well-being. Help your little one adopt healthy habits with Mouth Watchers, the leading toothbrush for better health! Stay Away From Sugar: While it’s a treat for your stomach – it’s certainly not for your teeth. Terrible for your health and pearly whites, all things candy, ice cream, cakes and pastries should only be for special occasions! Skip Soda: Your teeth’s worst enemy, help your kids to avoid the bubbly drink by offering them alternatives like flavored water or juices – but make sure they are low in sugar as well! Fill Up On Fluoride: For decades, there’s been a dental dogma associated with fluoride. Is it good for our teeth? Yes! Fluoride toothpaste reduces cavities in kids from 15 to 30 percent and the fluoride of public water supplies lowers cavity rates up to 40 percent. Set Up A Schedule: A good routine is always appreciated! Put a pea-sized squirt of fluoride toothpaste on their Mouth Watchers Youth Manual Toothbrush, set a timer for 30 seconds and let them have a turn at cleaning. Then practice rinsing and spitting together, and don’t be surprised if that’s your kiddo’s favorite part! Make it Fun To Floss: Children learn through play, so introducing educational flossing activities will help make hygiene fun! Sing a song, make it a fun game, or even create flossing chart to hang on the wall, adding a sticker for each time your child flosses. Give them a little reward for flossing a few days in a row such as staying up late, or a trip to the movies! Those incentives will keep them flossing forever. Say Goodbye To Pacifiers: Babies love their pacifiers, but many parents are rightly concerned that too much use can cause dental problems. The presence of a pacifier can harm the development and growth of the mouth and teeth. Prolonged use can cause changes in the shape of the roof of the mouth and create problems with tooth alignment. Break the habit early! Start teaching good oral care at an early age. 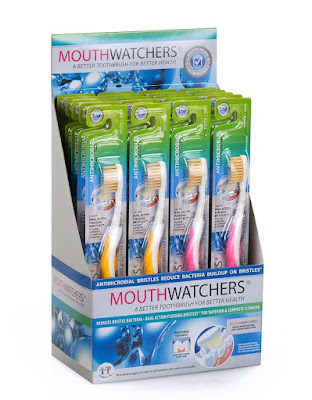 Encourage your kids to practice healthy hygiene habits with help from Mouth Watchers! With the holidays quickly approaching - this makes for a great stocking stuffer! Toothbrushes come in Manual and Power, available in Adult, Youth and and Travel sizes and range in price from $4.99 to $24.99 for the power pack.